As photographers, we know the value of capturing precious moments and creating memories you will cherish for the rest of your life. That’s why we believe your experience shouldn’t end when the photoshoot comes to an end and you’ve received your photos. We see the importance in turning the images we’ve captured into beautiful physical works that you can hold, hang, enjoy and share. Here are some of the products we offer. Click on one of the above products to be taken directly to more information, or scroll down the page to see them all! Available in three colours - Black, White, and Oak - all frames come in a range of sizes, so you can choose the option that best suits your home. A framed photo or gallery design makes the perfect statement piece for you to display proudly. Let us work with you to design a gallery of your favourites. 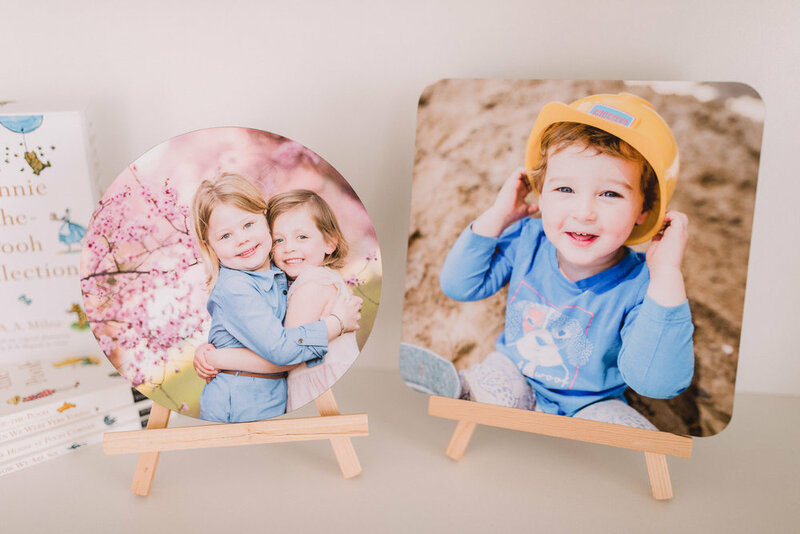 Our wood prints are a stylish alternative to regular prints, and make great features whether it be for a desk print, decorating kids rooms, or adorning your living room. Available in a range of sizes and shapes, these Australian made wood prints will look great in any location. Desk prints come with easel for display on desks/shelves. Allow us to design a collection of images for your walls. 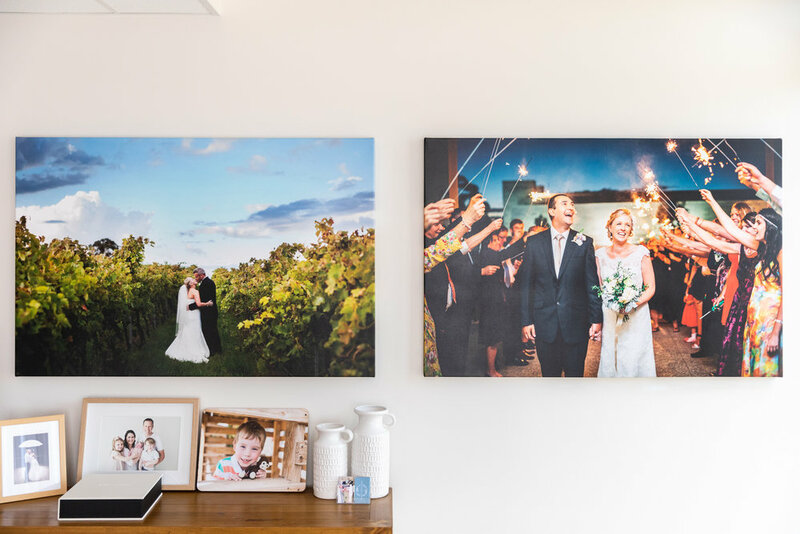 Canvas prints are a more textural printing option, and make fantastic standalone pieces for a wall, or can be combined with multiple images for a gorgeous display in your home! They come with a 75 year warranty against fading, and are covered with an accidental damage guarantee. Quality hardwood timber frames that won’t warp and lift off the wall. We are delighted to now offer albums for not only our wedding photography, but also newborn, family and first birthday portrait sessions. Elegantly designed and printed by a professional Australian bookmaker, we work with you to design them from the beginning stages to give you a perfect, unique album that best tells your story. Printed on 235gsm archival art paper with a 200gsm which is then applied to 200gsm cardstock.